Funny story from our weekend adventure: the wooden seesaw on the playground behind our tent snapped in half. 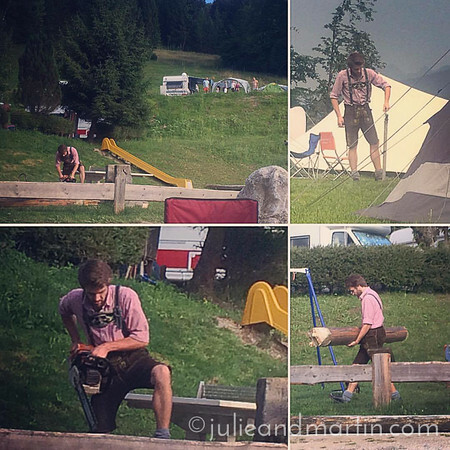 Within minutes, a tall, strapping young man in lederhosen showed up with a chainsaw and began hauling it away. Needless to say, he attracted ALL the attention. Especially from the young ladies in our group, who were still giggling about him at dinner. My dad joked, “You should report a problem with the plumbing, and see if he comes out for that.” Well, the next morning, we hear water gushing from the pump near the girls’ tent. Sure enough, the young man in lederhosen was there trying to fix it. We looked over at the girls, who were watching all the excitement from their tent. “It wasn’t us! We swear! Someone broke it before we were even awake!” my daughter said. Hmmmmm…. 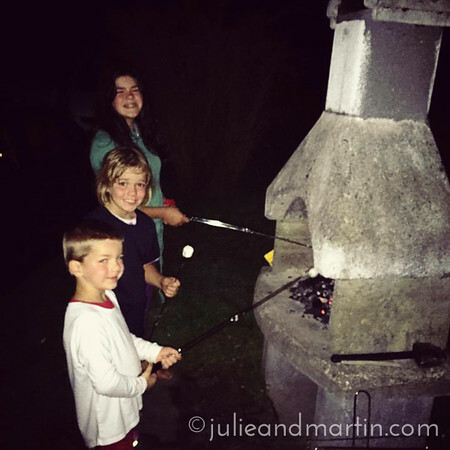 We weren’t able to have a campfire, but we still found a way to make s’mores!